Jericho wharf, currently under demolition, is visible here through the gap between the two buildings, there where you see the ocean. The beautiful Bill Reid-adorned hangar sits where the chain-link fence sailboat enclosure is located now. 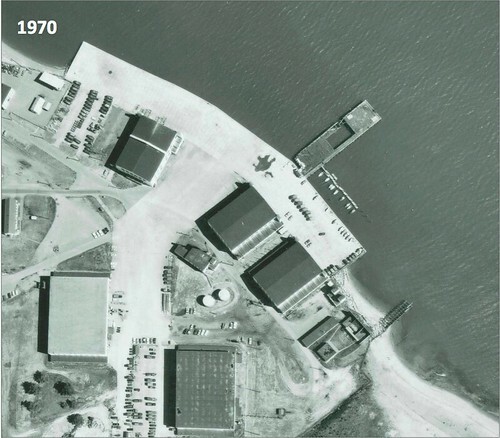 There were also two hangars set farther back from the shore, where the parking lots are now (this footage would have been shot in front of one of those buildings). Image is a screenshot courtesy CBC Archives Vancouver. Jericho Beach Wharf (properly known as Jericho Beach Marginal Wharf) is currently under demolition. A key location for Vancouver’s Habitat Forum event of 1976, its demolition marks the removal of one of the last vestiges of the Habitat Forum site, not to mention of the historic seaplane military base in which Habitat was housed. Sad as the wharf’s demolition is, the demolition of all five Jericho Beach seaplane hangars in the late 1970s was a much greater loss for the city than the loss of the wharf. (See the previous post on the wharf demolition.) Restoring the shoreline in an ecological manner once the wharf is removed is a good idea. However, this is just one part of a larger plan for the park, and that’s where the problem lies. Sadly, like many other Vancouverites I learned of the Jericho Beach public consultation process once it was mostly over, too late to participate in the formation of the new plan. Having looked at the new plans, which I find quite uninspiring and suburban, I wish the process had been better publicized and had gained more widespread input from across the city. (This is a familiar cry in neighbourhoods across the city, is it not?) We could have come up with something truer to the Jericho site and much more creative. Also, it’s unclear to me how the landscape design contract was awarded. One of the top landscape architects in the world, Cornelia Oberlander, lives in Vancouver. Not only is she world renowned, she’s quite specifically an expert in natural and ecological design. Why wasn’t Cornelia—or someone of equivalent stature—consulted on the plan for this key, historic Vancouver site? Why does Vancouver repeatedly squander its opportunity to achieve something transcendent? Or even to achieve something just better than mediocre? Does it think its natural landscape carries the day, and its built environment doesn’t signify? What follows is a brief critique of the plan and then some suggested alternatives. Since it’s apparently too late, my proposals are at the level of wish-fulfillment. But I would submit that such fantasies would, in other cities, have been made reality. In other cities they don’t demolish historic buildings at quite the same rate, replacing them with bland generic solutions dressed up with a few historical info plaques. This entire city seems to consist of a plaque where its history used to be. Cities change, and that’s fine, but most cities don’t obliterate their historical texture to the extent that Vancouver has. Just go walk around in any great city, and you’ll see what I mean. You can find the two variations of the new plan here, and a couple of sketches of the Parks Board’s plans are below. The specifics can be found here: Panel 1 and Panel 2 (PDFs; they take a while to load). There are two variations of the plan under consideration: “Nature Park” or “Park with Gathering Space.” Both plans do involve good natural solutions for the actual shoreline. The problem starts when you move away from the water. The Nature Park solution is far better in this regard, just because it contains less and therefore makes fewer design mistakes. The “Gathering Space” variation of the plan, however, involves some particularly unattractive and senseless features, including a seawall walk and a badly laid out gathering area. These bear no relationship to the characteristics of the site, and the use of the heritage railing is just without meaning here. Why concrete over this traditional path? Why not take the opportunity to do something truly natural? The public education displays show little familiarity with any historical formal elements found on the site, nor with innovative public display systems developed for similar sites elsewhere in the world. They look slick and cheesy. Please take a look at the plans yourself, and compare them to the photos of Habitat Forum below, where we started with some attractive historic seaplane hangars and, in an act of turning swords into ploughshares, made them warm and welcoming with simple hand-milled wood seating and handmade banners, simple paths, traditional lumberman’s arches and simple industrial metalwork. It just seems that the new plans are not worthy of Jericho Beach’s unique characteristics, its beauty, stature or history. I’ve spoken to many who feel the same way, including at the Parks Board’s own open house, and it now appears that many in the board and management of the Jericho Sailing Club (the main current occupant of the site and Vancouver’s only non-elite, public sailing centre) are equally opposed. At least one of the hangars should have been retained for community purposes, and I’d like to propose the rebuilding of one of these simple buildings as part of the plan to revitalize Jericho. Two of the original hangars were set far enough back from the water to fully allow for any future ecological restoration of the shore, and where they sat is now largely empty parking lot, even on a busy summer Saturday. The fact that the Park Board ripped them all down after a conveniently timed “accidental” fire is still galling to many of us who remember the Habitat Forum site. Why not put on back now? A new perhaps smaller hangar could provide an ecologically friendly, multipurpose space out of the rain, and be consistent with the ecological restoration of the shoreline. One of the current Parks Board plans does in fact refer to a multipurpose structure and “gathering place” to be built there; I’m proposing something more ambitious than that. And as it turns out, quite a number of those of us who experienced Habitat have quite independently had a fantasy of rebuilding one of the hangars. I feel certain that private fundraising could raise the money to achieve it. A hangar’s uses might include such things as farmer’s markets or children’s theatre or community classes, which would be a major asset to both the neighbourhood and the whole city. There is a dearth of music and performance venues in the city and it’s only going to get worse. There’s plenty of room at Jericho Beach for a scaled down version of one of the hangars. Why not reproduce Hangar 4 which, during Habitat, was effectively turned into something resembling a beautiful longhouse when its entire south end was painted in a mural custom-designed for it by Bill Reid? Below is how the hangars looked with a full audience seated inside. Here many have gathered for a concert (note the grand piano). Outside, visible through the open sliding doors, and beyond the current Jericho wharf and railing faintly discernible there, you can see freighters and small boats in the harbour. Thousands of people gathered peacefully in these beautiful airy spaces. As you can see from event posters of the time, there was also a policy of asking people to arrive by transit, foot or bike. In summary, the Jericho Beach site during Habitat was a beautiful, interesting and welcoming place full of history. For no good reason, the buildings and site were hastily demolished and then hastily replaced with one of the worst park layouts in the city: parking lots, chain link fence, and a couple of outdoor tennis courts to replace the indoor tennis courts the hangars had provided. Now we’re on the verge of doing it again. Why do we always seem to want to reinvent the wheel in Vancouver? And why is it that each time it’s an inferior wheel? Above, the Nature Park option. Below, the current state of the park. Below, in this pre-Habitat photo you can see all five hangars as well as the Sailing Centre – it’s the small white building at top left (it’s also marked on the drawing above). I’d be very curious to know what people think, both about the Parks Board’s proposals and about any of the above alternatives. You’re right, the “Nature Park” option does have something of a bland-as-cardboard quality to it. While I suspect that you’re idealizing other cities in the way they deal with their historical sites, Vancouver does seem to have a habit of razing over its history in an overeager attempt to be as modern as technically possible. But somehow we keep the ugly sites and tear down the interesting ones. I’d never even heard of Vancouver’s Habitat Forum. My only caveat about rebuilding a hangar would be to keep the design in the present, for the current needs and culture of the neighbourhood around Jericho Beach, rather than trying to recapture the atmosphere of 1976 – as beautiful as it sounds. We can have the same visions in mind as they did then, but developed for a new context. Thank you for making this website. Thanks for your comment, Ava. Very interesting. I do agree that nothing needs to be exactly copied – there could be an updating, but I see few examples of good public architecture in Vancouver that make reference to historical forms without seeming arch or postmodern in a dated way. Granville Island is our best example, and it’s worth noting that City Hall fought G.I. tooth and nail – they wanted it to be a simple, almost featureless civic park. The only reason it was pushed through, and pushed through using the existing, historical industrial buildings, was thanks to the vision of the federal government. And now it’s one of the jewels in Vancouver’s crown. Just something to think about! New buildings on GI have been built in a style faithful to the low industrial buildings once found at the site, and it’s been done very well. This is what I had in mind. Anyway, thanks again. For examples of things being done well, I’d look at Oslo (same size as Vancouver) or Helsinki. Seoul has a genius head planner and is doing some fascinating things with historic sites. Many examples in South America as well. Closer to home, Minneapolis has been very clever at saving many industrial buildings, someone managing to attract high level American and international architects to do it. We can do better here, I think. We love that spot, but didn’t know about the Habitat Forum 76, until we heard your PK talk. At the time we thought it would be really interesting to do a proposal for the site, based on design and historical context. IF you think it is still worth doing to propose/ see an alternative we would happily talk to you about it.